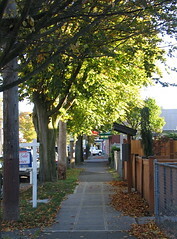 Looking down a Beacon Avenue sidewalk. Photo by Wendi from the Beacon Hill Blog photo pool. The other day we asked “what are five things you love about Beacon Hill?” The results are an interesting snapshot of the reasons many of us live here. The most common answer was “convenience.” Our location has “convenient access to just about anywhere (except perhaps Ballard),” and it’s particularly convenient if you like to visit Georgetown (two people mentioned our neighbors to the southwest). The light rail — and the access it will soon give to Sounders FC games — are something a couple of us are excited about as well. 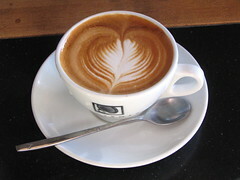 Many people mentioned particular Beacon Hill businesses that they love. Most loved were the Red Apple, El Quetzal, and Victrola (ex-Galaxie), but Yoga on Beacon, Kusina Filipina, MacPherson’s Fruit and Produce, El Delicioso inside the ABC Supermarket, and Culinary Communion also got some love. For being so close to Downtown and industrial SODO, Beacon Hill has a lot of nature to enjoy, and quite a few of you mentioned that. From “watching raptors over the greenbelt with my daughter from our front window” to “cloud-watching from my back porch” to enjoying “the fall colors along Beacon Avenue south of Columbian Way,” we get a lot of nature enjoyment from our perch above the city. And for that matter, we have some views, too. “The winter view of the Olympics” and “the stunning view of the Seattle skyline coming off of Beacon” are something we get to see all the time — don’t you feel lucky? You can read all of the answers people gave and see who said what on the original post, and add your own comments if you like. Thanks to all those who answered so far! I’ll post another question soon.